Three Department of Literature and Philosophy students, under the tutelage of Olivia Carr Edenfield, Ph.D., got the opportunity to explore the works of their favorite authors in ways most undergraduate college students never experience thanks to the generous support of the George K. Brannen English Scholars Fund, Georgia Southern University’s Student Government Association, and the College of Liberal Arts and Social Sciences (CLASS). For Molly Donehoo, a member of the Georgia Southern Women’s Soccer team and a senior English major, it all started with a roadblock. 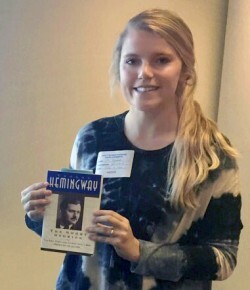 Molly, who hails from just outside Atlanta’s 285 corridor in Clarkston, Ga., wanted to see the Ernest Hemingway Collection to learn more about his writing process and to explore his thoughts on games, specifically pool, which was to be the focus of her Senior Seminar paper. Molly thought this would be an easy enough task. 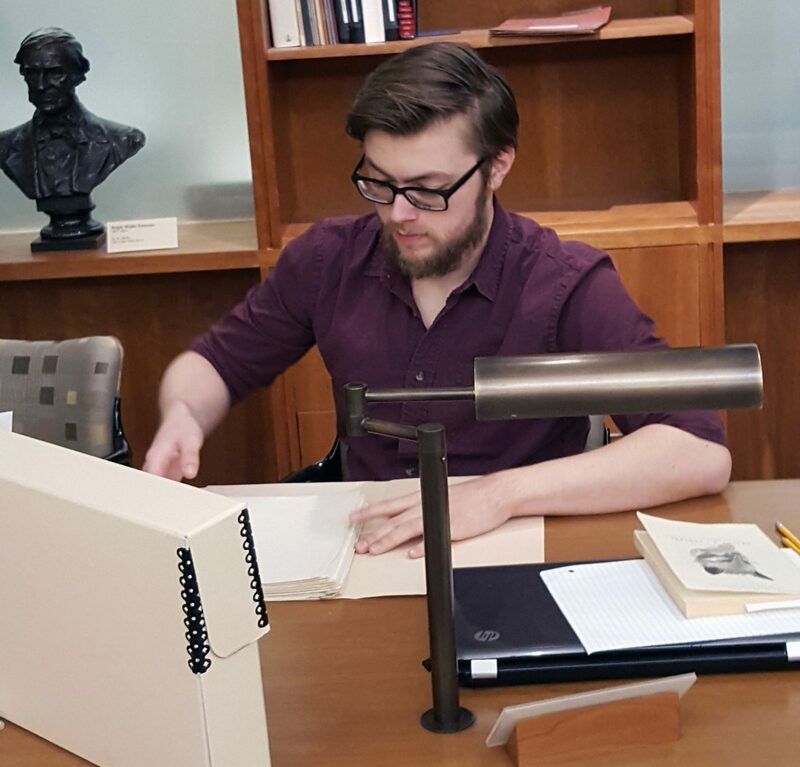 Though the collection resides in the John F. Kennedy Presidential Library and Museum in Boston, it is custom for the presidential libraries to ship collections to other presidential libraries to further scholarly work. She requested the collection of papers and artwork, which was retrieved by Mary Hemingway in the height of the Cold War from their former home in Cuba, be sent to the Jimmy Carter Presidential Library and Museum. 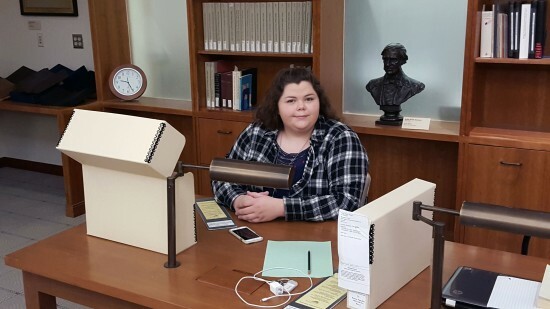 The Library is located about 10 miles from her home, and over the winter break she could make the short drive each day to conduct her research. However, the plan hit a snag as the Hemingway archives had lost its curator and could not ship to other libraries. It was an option though not a cheap one. Edenfield helped her and two other students, Megan M. Flanery and Hunter Walsh, apply for funds through the George K. Brannen English Scholars Fund and Georgia Southern University’s Student Government Association for the trip. They were grateful to receive the funds, but they were insufficient to cover the full cost of both trips. Thankfully Curtis Ricker, Dean of CLASS, stepped in and the College picked up the remainder of the cost; the three students were on their way up the East Coast. Megan and Hunter were taking a separate trip to the University of Virginia to see Pancake’s archives, overseen by John D. Casey. Casey is a noted novelist in his own regard and former professor of Breece D’J Pancake at Virginia. Megan and Hunter had previously presented on Pancake at the CURIO Symposium and after reading all the available scholarship wanted to learn more about him. Pancake had published six short stories in his lifetime before committing suicide at the age of 26 in 1979. He was a native of West Virginia, which interested Hunter who is also from the area. Pancake attended Marshall University in his home state, graduating with a bachelor’s degree in English in 1974. He had been pursuing a graduate education at the University of Virginia at the time of his death. “Learning about his death drove me to want to understand more about him,” Hunter said. The University opened up its collection of documents on Pancake, including personal letters and notes, to the two Georgia Southern students. What they found in those documents gave them new insights into the man and author. They discovered letters to his family, a letter apologizing to Casey, work on his first novel, and a new order of his previously published short stories. They plan to use this in their senior seminars and want to share them with the world so that a better understanding on the life and times of Pancake can be reached. 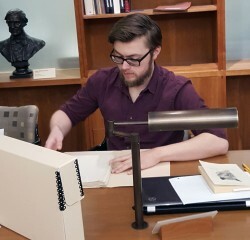 Megan and Hunter were also interested in the family dynamic found in his letters and his connection with his father. They both noted that Pancake was his own worst critic and routinely wrote personal criticism of himself and his writing. This rare opportunity for undergraduate students had a great impact on all three of Edenfield’s students. “I saw an energy and passion for their work when they came back from their trips. I know they are excited to share their findings with other students,” Edenfield said.